Aimed at scientists, engineers, modelers and other technical users of GIS/mapping applications, this lesson provides a basic understanding of different vertical datums, how they are defined, some of their strengths and weaknesses and how to choose the appropriate datum for a given application. The lesson starts with basic definitions of height and vertical datums and guidance on choosing and working with the appropriate datum for a given situation. It then provides a conceptual introduction to ellipsoidal, geopotential and tidal datums including appropriate uses, examples and pros and cons. I have had some training on this subject but was still confused. This course cleared up my confusion and made sense of the different models and datums and how to go about determining what datum to select for my projects. Good introduction to the subject. Good at giving basic background information! Quite helpful! The lesson was informative but the layout was a bit confusing at times. Seemed to jump around a bit.. It would be very helpful to see more detailed results in our quiz scores- see what we answered and what the correct answer is with an explanation for the correct answer. Great lesson, although I had some knowledge my understanding increased significantly as evidenced by the final quiz. This is a great class for an introduction to the subject matter. Review quizzes help to reinforce learning. Highly recommended. i wish the test would help you understand why you got it wrong vs just telling you its wrong. As an entity identified with surveying, a poll such as this one should not be called a "survey". Good comprehensive overview of height systems. The mystery of the St. Lawrence River flowing uphill is explained! 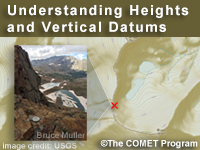 This lesson on understanding heights and vertical datums is helpful for a broad overview of the subject, however, it might require more than once going through it to fully absorb all the material. I wish there were more examples of what the various datum systems describe since it's not so easy to see what the differences are. Also, the 18th century controversy between Newton and Cassini does not explain what methods they used to settle the question, but perhaps that is beyond the scope of this lesson. The study is good and has the capacity to increase the knowledge of students. The lesson materials are also fixable Nad easy to understand. I am a licensed Land Surveyor and this type of online training is very helpful to maintaining my understanding of issues related to my profession. Lesson may be easier to follow if more animated video explanations are done. A very good introduction to the subject of datum and the difference between an ellipsoid and a geoid. This course gave me a much better understanding of heights and vertical datums. I'm sure you could not imagine it! Great overview of the intricacies involved with determining "height". A very good introduction for understanding heights and vertical datums. I would like to see more examples in understanding the heights and vertical datums. I would strongly recommend this course for all GIS oriented students. It is very good opportunity to learn new skills. I really appreciate the training regiments, and the opportunities to be able to utilize them, they are really great tools, and well defined educational proprieties. Great learning module, Thanks NGS and others who help put this together. Great overview, kudos to NGS for helping to create this. Describe how heights and vertical datums are used in surveying. Define height as used in the context of surveying and mapping. Provide reasons for choosing different vertical datums. Describe the global nature of ellipsoidal datums. Describe strengths and weakness of ellipsoidal datums. Explain why geopotential datums help describe water flow. Recognize NAVD 88 as the current geopotential datum in the U.S. Define orthometric height, geoid height/geoid undulation, and dynamic height. Describe strengths and weakness of geopotential datums. Describe the local nature of tidal datums. Explain why tidal datums are important and what they are used for. Describe strengths and weakness of tidal datums.